Drop in to see what's cooking at our fellow bloggers who have taken up this Marathon, each of them taking up a particular theme. Cook rice as per preference and set aside. (I used the rice cooker to cook rice). In a heated wok/kadai, add 2 tsp of oil and the rest of the seasoning. After the cumin seeds start to brown, add the onions and saute until golden brown. Add the chopped green chillies, tomatoes and chopped capsicum. Add turmeric and cover with a lid so as to let the capsicum get cooked al dente. After about 5-7 min, when the capsicum is fork tender, add Vangibath Powder and salt. Once the mixture is near water-free, reduce the heat and add the cooked rice and mix well. Adjust the taste and squeeze in some lemon juice. 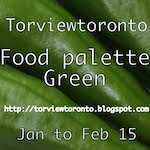 Linking this to TorviewToronto's 'Food palette series Green' . yummy and delicious capsicum rice. another yummy dish....nice recipe...looks delish! Capsicum does add taste. Yummy. I did notice that you use vangibath powder in almost every rice dish you prepare.. :-) Capsicum rice looks super delicious! I love capsi in rice, very inviting rice dish.. I like capsicum flavour with rice looks delicious. wow, lovely and looking delicious dear. Capsicum rice is one of my go-to dishes when in hurry or busy. Yours looks delicious. I love this too..nice addition of vangibath powder..
Looks good. I feel I can't survive with out vangibhath powder. I usually make this capsicum bhath with potatoes and peas. M is the only one who loves capsicum at home and so it goes for his lunch box. Looks great harini..it's nice to have dishes that come to our rescue right.. This post reminds me that it has been ages since I made capsicum rice. Looks good. Thanks for sharing!